Plot Synopsis: As seen on PBS’s Masterpiece Mystery! Putting his brilliant intellect and fastidious nature to the test, Agatha Christie’s famous Belgian detective solves the most mystifying crimes of the Art Deco era in these dazzling adaptations. 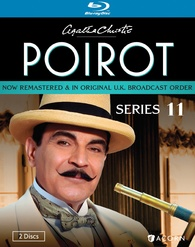 David Suchet gives the definitive performance of Poirot and leads star-studded casts including Tim Curry, Elizabeth McGovern, John Hannah, Harriet Walter, Siân Phillips, Peter Bowles, James Wilby, and Zoë Wanamaker in these four feature-length mysteries. THE MYSTERIES (original U.K. broadcast order) Mrs. McGinty’s Dead—With the help of mystery novelist Ariadne Oliver, Poirot tries to save a potentially innocent man from execution. Cat Among the Pigeons—A new student causes a stir at the Meadowbank School for Girls. When the bodies start turning up, Poirot is on hand. Third Girl—Collaborating again with Ariadne Oliver, Poirot helps a young heiress who thinks she may have committed murder. Appointment with Death—The reviled wife of an archaeologist is killed at a dig in the Syrian Desert, leaving no shortage of suspects.